The Bridge (Bron/Broen) is a Danish-Swedish TV co-production set on both sides of the Øresund Bridge that links Copenhagen, Denmark & Malmö, Sweden. Borgen is a Danish political drama sent in Copenhagen. Despite being a subtitled Danish show loosely based on complicated domestic Danish political events, it grew to unexpected popularity throughout Europe. Its protagonist is a prime minister attempting to hold together a fragile ruling coalition and trying to mitigate the ruination of her personal life. 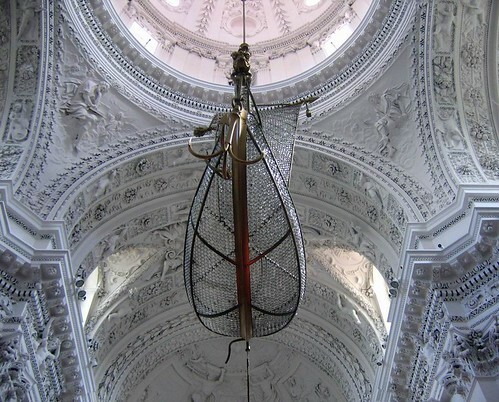 Western European churches, especially those near or in shipping towns, often suspended a model ship from the ceiling as a symbol of good luck for sailors. The practice is probably most common in Denmark, but is fairly widespread. It would be surprising if the current craze for ship chandeliers in decor (see the ship chandeliers in houses at bottom) weren’t related to this tradition. I found Lost City Arts by accident when searching for works by Harry Bertoia. Like this shop, Lost City has eccentric art and furniture pieces that are substantially more eye-catching or compelling than market-produced objects mainly because most of their art furniture was, in fact, made by sculptors.